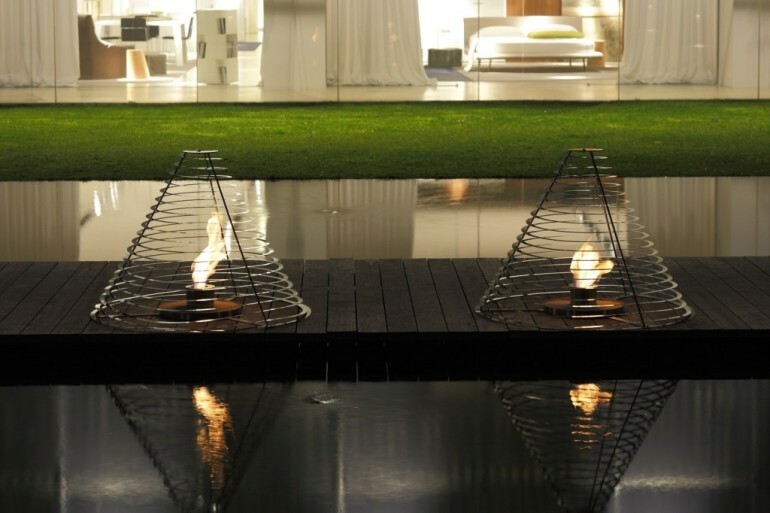 Archimede bioethanol fireplaces is an original idea of famous, Italian brand Acquaefuoco, that becomes famous all over the world as a manufacturer of unconventional and modern heating solutions. Archimede is a combination of functionality and compelling design. A traditional fire was an inspiration for this model. Bioethanol fireplace is a small burner located inside a metal stand, designed as a cone. It is made of metal spiral-shaped seams and due to it we can enjoy the view of gentle flame the whole year. Bio fireplace can be placed in any way we want, because burner is visible from every side. Moreover, Archimede is small-sized and due to this fact it could be located in every place. Due to its construction, bio fireplace delusively resembles backyard fire. It was created with a view to it. Model can be also used outside. It will be a great decoration for our gardens, but also for modern terraces and balcony. The spiral with the burner inside is made of steel with a gentle lustre and it matches to nearly every room, regardless of a colour. Archimede is a solution for those, who like spend long, summer evenings staring at gentle flame, that let us relax and remember times spent by the fire in childhood.